We’re constantly developing tools and features that can help drive more unit sales for Teespring sellers. 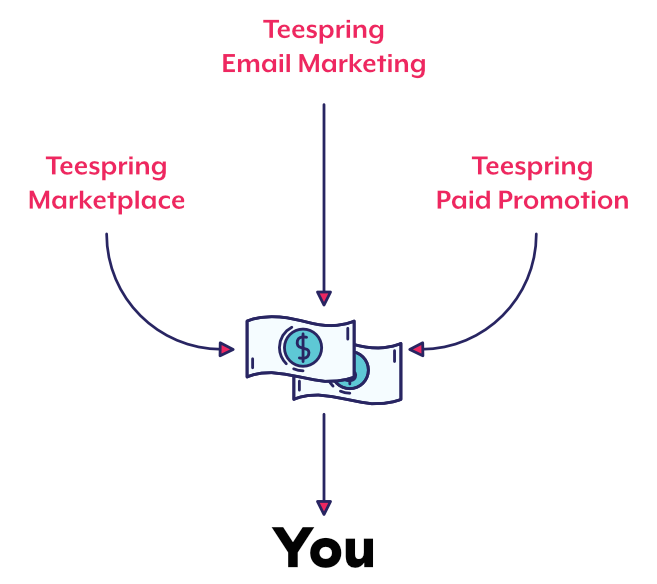 One of the ways we’re working to help you sell more is through Teespring Marketing—an initiative designed to help bring more buyers to you. 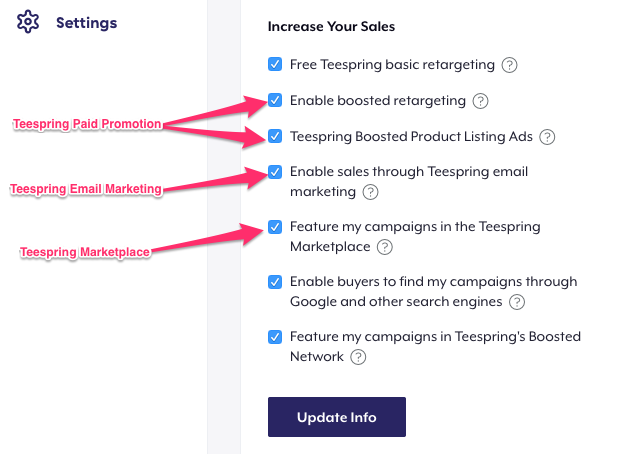 Between Teespring Marketing and the new Boosted Network Teespring can help you drive more sales than ever! Hundreds of thousands of shoppers search within the Teespring Marketplace every day. Marketplace search results are ranked based on an algorithm combining buyer search terms, listing keywords, sales history, and seller trust scores. To increase your ranking in search results we recommend optimizing listings, driving sales, and complying with our design policies to maintain a good trust score. Paid promotion includes retargeting (basic & boosted) and boosted product listing ads. We use paid promotion to get your products in front of potential buyers with the highest likelihood of purchasing. Keep in mind basic retargeting is a free service for our sellers (learn more below). Email marketing consists of creating messages for specific buyer demographics from Teespring’s buyer database. Buyers lists and featured products are selected by our team based on behaviors, related interests and purchasing trends. Our aim is to target buyers who are most likely to purchase your products. How many more sales per month can Teespring Marketing help me get? Currently, 3 in 10 items sold on teespring.com can be attributed to Teespring Marketing. We have seen this initiative increase the amount of unit sales for many sellers by over 30% each month. What would an additional 30% in unit sales mean for you? If your campaign sells 100 units, Teespring Marketing could generate an extra 30 units for you (or more)! How much does Teespring Marketing cost? Several of Teespring’s marketing services are free, but some do incur a Cost per Order, also known as a CPO. This fee is deducted from profit (so there’s no direct cost to you) and the reason we include this fee is so that we can reinvest the funds into further optimizing Teespring Marketing (and continue acquiring sales for your campaigns). For example, the base price for a t-shirt is $10 and you choose to sell it for $25, you would keep $15 in profit. If you acquire the product sale through Teespring Marketing you would earn $8.25 in profit after the $6.75 CPO (cost per order) is deducted. Essentially you earn the additional profit without any additional work. Keep in mind CPOs are only applied to the order, so if a shopper places 1 order through Teespring Marketplace and purchases 3 products, the CPO is only applied once. Teespring Email Marketing: the sales acquired through Teespring branded marketing emails which are periodically sent to our buyer database. If someone purchases one of your products, profits from the sale are split between you and the seller who originally brought that customer to the platform. Teespring Paid Promotion: opting in to boosted retargeting gets your products more valuable ad placement and can boost your sales even more than basic retargeting. Product Listing Ads help you acquire sales through Teespring’s shopping ads in Google and other search engines ($6.75 CPO). Teespring Marketplace: the sales you acquire through Teespring Marketplace. Products featured in the marketplace can get millions of views per month. In fact, there are several sellers who currently acquire over 60% of their unit sales through Teespring Marketplace alone ($6.75 CPO). How can I see the number of sales Teespring Marketing is generating for me? In your Teespring Account, you’ll notice that each listing’s analytics has a “Source of Units” table; here you can see a breakdown of where all your orders are coming from, the total number of units reserved and the total profit (minus any CPOs). How can I get my products featured in the Teespring Marketplace? Marketplace search results are ranked based on an algorithm combining buyer search terms, listing keywords, sales history, and seller trust scores. To increase your ranking in search results we recommend optimizing listings, driving sales, and complying with our design policies. Learn more about trust scores here. How can I opt-in or opt-out of different elements of Teespring Marketing? All you have to do is sign in to your Teespring Account, go to “settings” in your dashboard and update your profile preferences. Check all the boxes in the “Increase Your Sales” section to opt-in to each marketing service. You can hover over the “?” symbol for more information on each marketing service as well. You can also opt-in to Teespring’s Marketplace on the listing level through your listing’s settings.